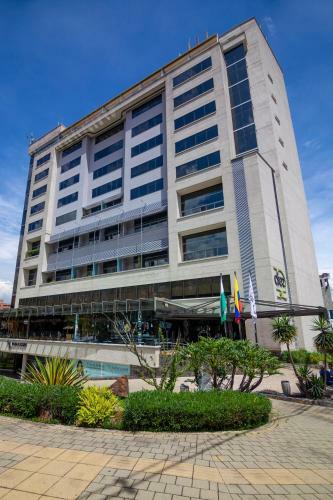 Lock in a great price for Diez Hotel Categoría Colombia – rated 8.8 by recent guests! Great location, super comfy bed, amazing coffee at lobby and great view from room. Modern & Smart hotel. I like this hotel very much. Great value, great location, friendly staff, good complentary breakfast, comfortable bed, nice room overall. I would definitely stay there again. 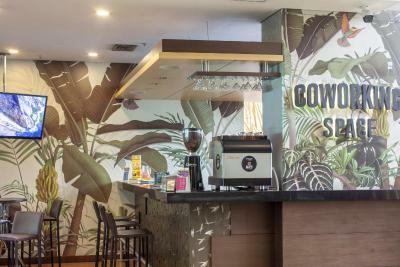 Comfortable bed, great location close to the downtown area and good restaurants, including ones with vegetarian and vegan food, nice view from the fitness center, carpeted rooms, which are good for doing yoga or stretching, good fruit choices and plain yoghurt for breakfast. Great, helpful staff! Very comfortable soft bed which is hard to find in the area. Very clean, friendly staff, exceptional service. Hands-down this was the best value hotel of our 3 weeks in Colombia. We did book with an especially low rate which I think was just temporary. The room was pristine with lots of character matching a theme for the whole floor which included hand woven baskets and nice light fixtures. The view from our room on the 4th floor was phenomenal. The included buffet breakfast was an overwhelming value. Great Location! Very nice staff, everything clean and comfortable. LOCATION, the location is ideal and you can easily navegate Madellin from there. 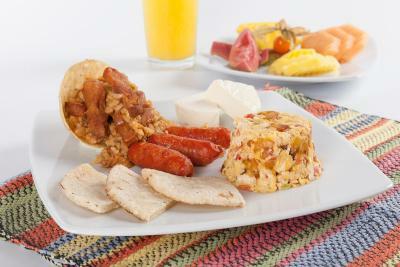 FACILITIES, the rooms are spacious and quiet, the free breakfast is plenty and delicious. The terrace is on the 6th floor and has a beautiful view of the city. 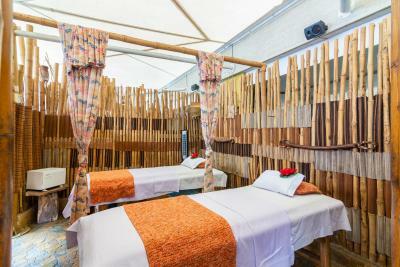 The hotel partners with a spa company for your convenience and it's located on the terrace. The bottom floor has a travel agency and a beauty salon. SERVICE, The hotel personnel is outstanding, they are always nice and helpful and have a great disposition. 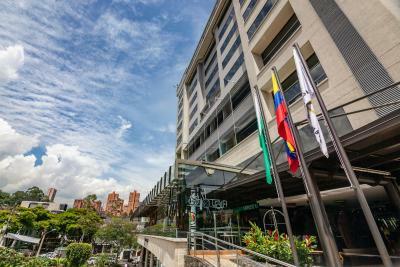 We travel as a couple and had an awesome experience in Medellin and at the Diez hotel. Remember to be a pleasant and respectful visitor. 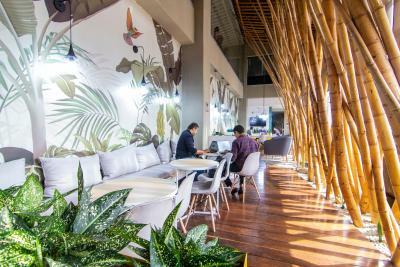 Diez Hotel Categoría Colombia This rating is a reflection of how the property compares to the industry standard when it comes to price, facilities and services available. It's based on a self-evaluation by the property. Use this rating to help choose your stay! 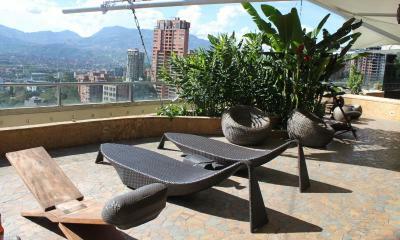 One of our top picks in Medellín.Inspired by the culture of Colombia, this design hotel offers luxurious rooms. 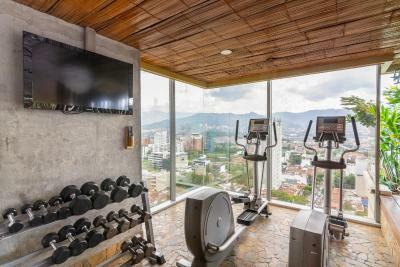 Located in the commercial center of Medellin, 0.9 mi from Poblado Metro Station. 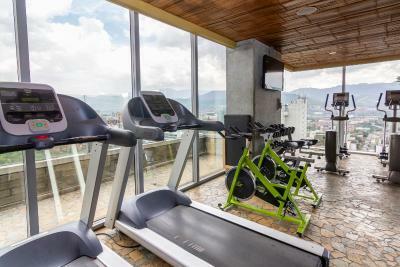 The Hotel offers Free WiFi, a fitness center and a spa. Each floor is inspired on a different region. 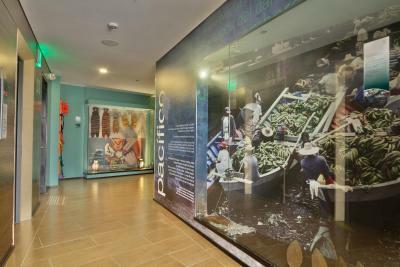 The rooms at Diez Hotel are decorated with local handcrafts in combination with modern technology. All offer a view of the mountain and city. 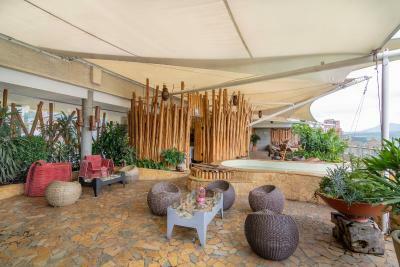 Wellness facilities include several massage treatments, a sauna and a Turkish steam bath. Guests can also relax in the hot tub, while enjoying the views. Diez Hotel's tour desk can arrange trips in the area. Souvenirs can be bought in the gift shop. 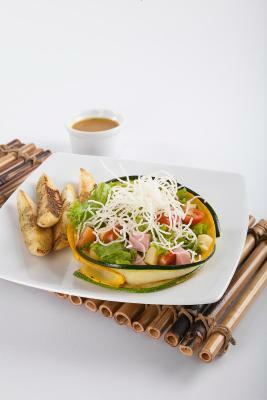 Dining options are offered at Guaduas Bar, Boga and Diez Restaurant, that serve national and international dishes. 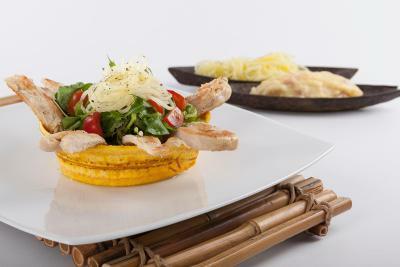 In the commercial area on the ground floor, several other restaurants offer different food choices. José María Córdova International Airport is 9.9 mi away. Free parking is possible on site when arriving by car. 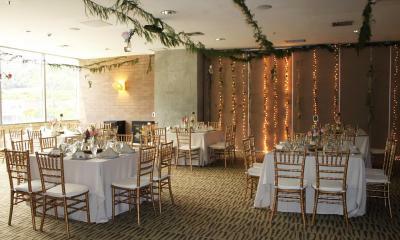 When would you like to stay at Diez Hotel Categoría Colombia? A spacious room with a large double bed. More spacious room, includes a sitting area. This room features twin beds, free Wi-Fi, safe, cable TV, air conditioning, and minibar. This room can be either a twin or a double room, depending on the availability of beds. This triple room has air conditioning, mini-bar and soundproofing. 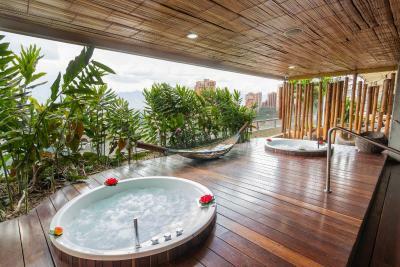 House Rules Diez Hotel Categoría Colombia takes special requests – add in the next step! All children under 6 years are charged COP 80000 per night for extra beds. Any additional older children or adults are charged COP 80000 per night for extra beds. Diez Hotel Categoría Colombia accepts these cards and reserves the right to temporarily hold an amount prior to arrival. Breakfast could be better... The omelet doesn't taste so good. Location is perfect. 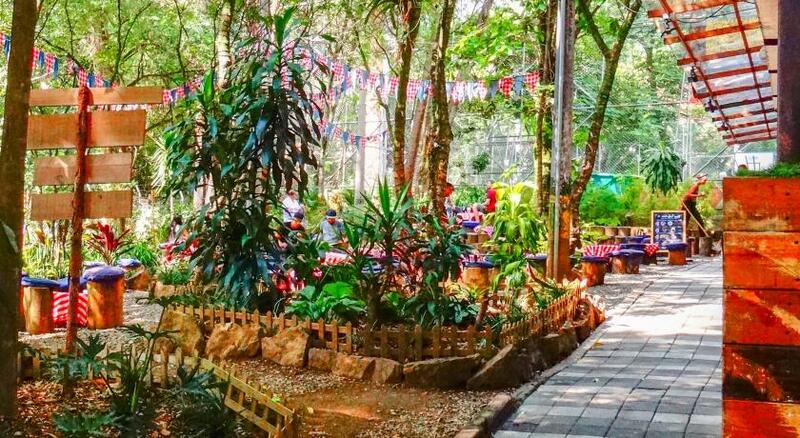 Very close to parque Lleras and reasonable walking distance to metro station. 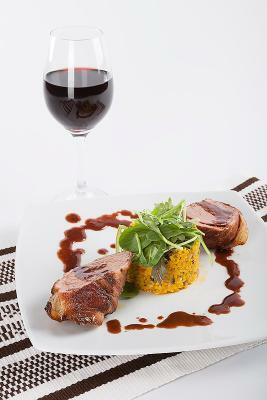 Very good restaurants at the hotel area. Rooms are very nice and the decoration is beautiful. In the country of coffee, and 5 star hotel, they should serve included with breakfast also espresso coffee, not only American. Big comfortable room, with nice view. A lot of good restaurants around. The break fast tires and isn't very varied, many flours within the menu. The Spa areas the staf is very distracted. The building is well located. Lighting in bar of hotel was terrible, not warm or cozy. Laundry lady came knocking on every door at 9am saturady morning waking us up and everybody who was sleeping. The bathroom isn’t very private, and the location seems to have the hotel surrounded by very loud bars/clubs. My wife and I could barely sleep with the sound of loud music all the way until about 4am. The hotel was very nice and clean. Friendly staff and beautiful and comfortable room. Not enough light in the room, one can’t read in the room neither at the table, nor in the bed There is a glass shelve beside the toilet, too low, so we hit our heads many times. It could result a more serious injoury. Too many sugary cereals for breakfast. Would be good to have more healthy choices. I heard slight thumping one night on the mountain side of the building. I imagine it might have been louder on the city side. But I only heard it 1 night and I stayed there 5 nights. Maybe from a disco, not sure. Otherwise it was quiet and good for sleeping. The shutters on the windows clanged a bit and made noise when the air conditioner was on. But you can put a chair or lean the ironing board against to eliminate that noise if it is an issue for you. I am an especially light sleeper, so the noise issues I have may not bother you at all. And like I said, it was mostly very quiet. The windows don't open, which is a negative, but I think the trade off is that the thick windows make it quiet. My main complaint is that they gym is very limited. No machines. The bike is poor quality, but the treadmill and elliptical machines are great. And the view is fantastic! I hope they add some machines to make it a real gym. Some dumbbells to use, but that was it. But overall a great place to stay! Amazing stay at the Diez Hotel, I highly recommend it!! !